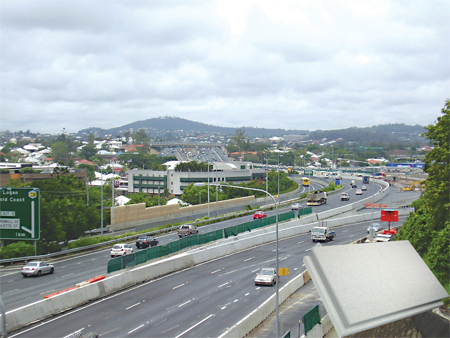 The North-South Bypass Tunnel (NSBT) runs for approximately five kilometres from Bowen Hills to Woolloongabba in Brisbane, Australia. Consisting of two tunnels, one for north-bound and one for south-bound traffic, it will be a cross-city link eliminating up to 18 traffic lights and reducing travel time by up to 15 minutes. The ventilation shafts and stations are part of the buildings of the North South Bypass Tunnel network that serves as a system for safe tunnel ventilation and as an emergency system for extraction of smoke out of the tunnel during a fire emergency. There was some controversy over the positioning of the ventilation shafts for the tunnel, with them being cited as a possible environmental hazard with noise pollution a concern. The concern was that traffic and ventilation noise might escape from the shafts affecting the surrounding residents. The noise issue was one of reflected noise. To solve the problem, a product with high acoustic absorption was required to control noise pollution from reflected noise. The further problem was to find a product that had high acoustic performance and yet could withstand the issue of contamination, weather aging and at the same time be fire safe to a non combustible level. Pyrotek noise control offered a unique solution with Reapor sound absorbing panels. The panels are fixed with a cement system to maintain fire rating. The ventilation shaft plenums were lined with Reapor to control the escape of reflected noise. Also NRC being .90 has non combustible and unaffected by weather pollution. Since the system is easy to install, it saved time during construction with the resulting performance exceeding expectations and reducing the emission of traffic and ventilation noise to an acceptable level.